Figure 1. 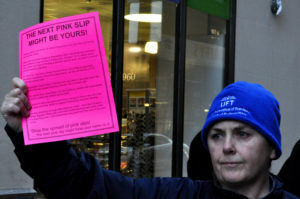 This woman is protesting while holding a “pink slip”, or a notice of dismissal from employment. The Philipps Curve is a supposed inverse relationship between the level of unemployment and the rate of inflation. The Phillips Curve is a key part of Keynesian economics, at least the Keynesian economics of the 1960s. In this section, you’ll learn what makes the Phillips curve Keynesian, and why neoclassicals believe it may not hold in the long run. This speaks to the effectiveness of demand management policies, which is a major subject of this module.